On this thirty-second death anniversary of Zulfikar Ali Bhutto, allow me a moment to reflect on the meaning of this occasion without judgment. Bear with me whatever your political affiliation. I come to bury Bhutto, not to praise him. Zulfikar Ali Bhutto was a man. Like all men, he had his strengths and his failings also. Like very few men, though, he left a lasting impression on his country. When he founded Pakistan People’s Party in 1967, he did so under a revolutionary idea – that all power should reside with the people, not an elite. Recall that this was a different time than today. There was no pan-Islamic democratic movement, and his rise followed a long line of dictators and martial law administrators. Actually, he too would be followed by one of the most damaging military dictators the country has suffered through. 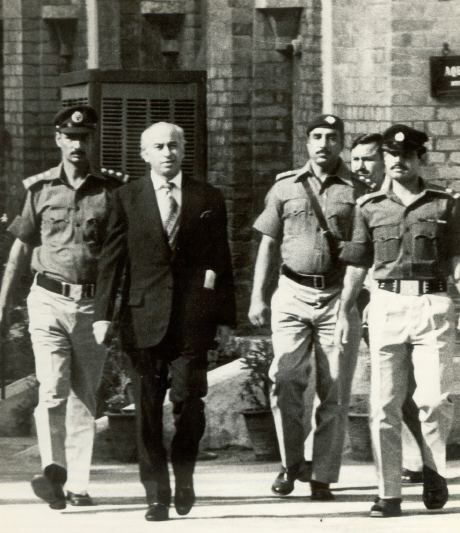 Bhutto had to know always that this idea of democracy would not be so easily put in place, and that the struggle would cost him dearly. And yet, he willingly made this sacrifice. He went out every day knowing that it could be his last because he knew what was right for his country had to be done. He knew that if he, with all of his privilege, was not willing to sacrifice, how could anyone else be expected to? We know our great martyrs lives will not be avenged if any insignificant man alone is held responsible. For us to have our revenge we must insure that the circumstances that allowed for Shaheed Bhutto’s Judicial murder never arise again. For us to take revenge of Shaheed BB’s assassination we must defeat the forces of violent extremism and dictatorship that together assassinated my mother. To do this we must dedicate our lives to the establishment of a fully functioning democracy in Pakistan. I contend that this sentiment holds true not only for avenging the death of ZAB, but of Mohtarma Benazir Bhutto also. And not only for Bhuttos, but for the 50 people who were martyred at the shrine of Syed Ahmad Sakhi Sarwar; for the 12 year old boy killed by a suicide bomber at Dara Adam Khel; and for the thousands of innocent Pakistani men, women, and children who have been killed by ruthless madmen who use violence as a tool of power. The only revenge is not through violence, but through the continued struggle for justice, equality, democracy, and basic human rights for all Pakistanis. Bilawal ended his speech to the PPP CEC with the slogan, ‘Jiye Bhutto’. This is meant to invoke the unbending spirit of PPP founder Zulfikar Ali Bhutto and his daughter Mohtarma Benazir Bhutto who sacrificed their lives for the ideal of social progress and democracy. But these two martyrs of Pakistan are not the only ones who show that strength of purpose. It is that same determination of spirit that makes each of us go out each day to continue working to build a free and prosperous Pakistan for the future of our children. That fire in Bhutto’s heart is the same fire in our own hearts that drives us to sacrifice for our country and to never, never give up on the promise of Jinnah’s vision. As I look out the window onto my country torn by distrust, fear, and the violence of ambitious men who will stop at nothing to stop the rise of democracy, I realize that on this death anniversary of Zulfikar Ali Bhutto, it is not one person only that I honour, but many. It is for Hussain Ali Yousufi, Imran Farooq, Salmaan Taseer, Shahbaz Bhatti. It is the thousands of brave soldiers and police who willingly risk their lives to defend the freedom of their country and their people. It is the spirit of democracy that lives on in us all. Hum Sub Bhutto Hain. Pakistan Zindabad.